Are you used to having daily, weekly, or monthly planners to help organize your busy life? Do you find yourself, occasionally, writing dates and hours on a piece of paper to plan ad-hoc activities? Sometimes it seems just easier to do it by hand on paper than online. 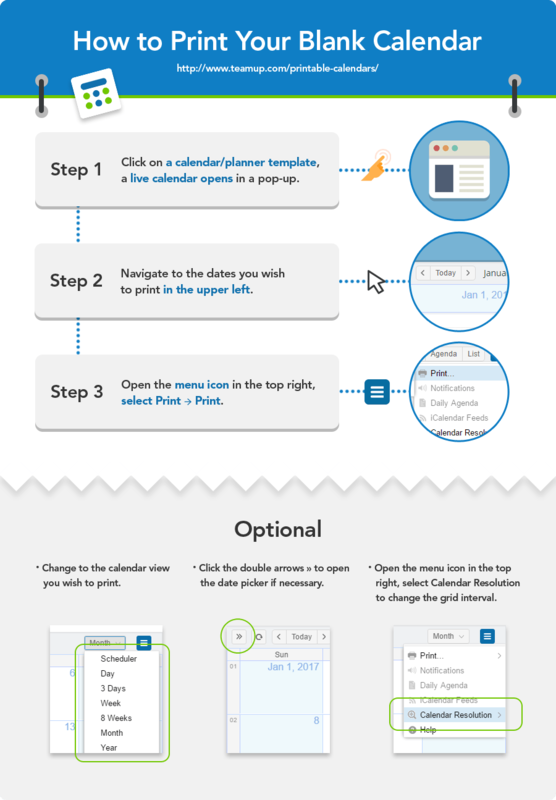 We have created some blank calendar templates for free print at any time. You can enjoy more flexibility and convenience without drawing grid by hand or giving up the simplicity of paper & pencil. Replace the default calendar link with yours to use the settings of your own Teamup Calendar including your logo. Make sure "&showLogo=0&showTitle=0" are removed from the parameters accordingly if you'd like to display your logo and/or title. Click the double arrow to open the left side panel, click "All" above the calendar list once or twice to hide all existing events to make the calendar blank, then close the side panel. Or simply use the widget below to generate an ad-hoc blank calendar with the default printable calendar link. Leave empty if you don‘t need specific Name. Note the parameters in the URL of the generated blank calendar. These are configurable and can be applied to your own calendar links. Learn more about link parameters. Using the widget without a title will hide the entire header, including the Teamup logo. For daily or weekly planners, you may change the "Calendar Resolution" as illustrated to your preferred grid interval.